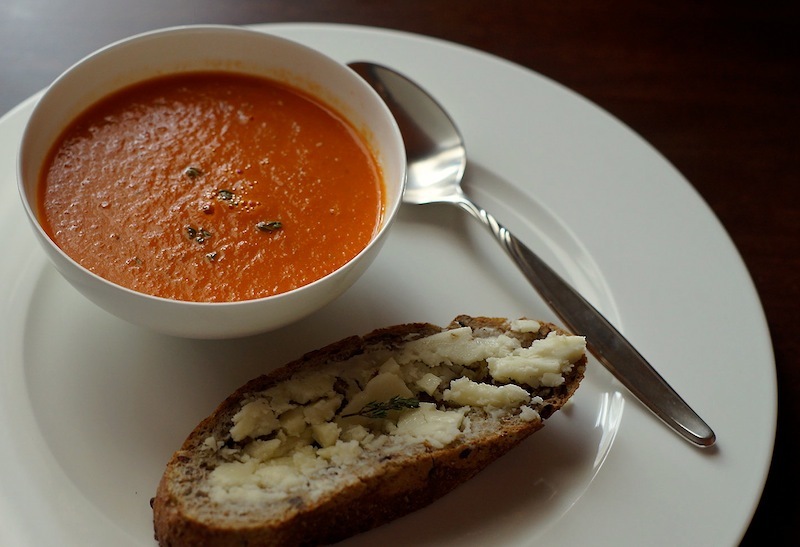 Tomato soup always brings back memories of home and my country, as soups in Portugal are rich and comforting. Often they are even the main course for a light dinner, accompanied by a bit of bread and followed by fruit or a dessert. They say that when you are pregnant and you eat a lot of a particular food, your child will come out loving it. I don’t know if that’s the origin of my passion but my mother will vouch for it while explaining the great amounts consumed when she was pregnant with me. Tomatoes always find a place on my weekly meal planning and for a few years, it would even be the star of my every salad. Any type of salad greens always seemed to me more appropriate for crickets than for humans. Over the years I’ve changed but in spite of using now all sorts of salad greens, tomatoes still remain my first love. If I’m honest, I could also vouch for my daughter’s love of tomatoes. When I was pregnant, I also consumed ridiculous amounts of tomatoes. Besides my obvious passion for it, I was very afraid I would get sick with badly washed salad greens and tomato always seemed in my eyes to be safer. The fact is she just loves tomatoes! Everyday she will come to the kitchen when I’m cooking lunch or dinner and she will ask me if her food will include tomatoes. If I tell her yes, she will be thrilled and say I’m the best! If I tell her not this time, she will look at me with a “what was she thinking” special look. I always have to promise her I will include it in the next meal! This soup is adapted from a Portuguese recipe of a chef I particularly like, Mafalda Pinto Leite. The cherry tomatoes roasted in the oven with a bit of sugar, olive oil and garlic are the key ingredient and give the soup a nice sweetness and richness. I find the toasts with Feta and thyme the perfect pairing. Preheat the oven at 200ºC (400ºF). Place the tomatoes on a baking tray, cut side up. Add the garlic cloves and sprinkle with the sugar. Drizzle with 1 tbsp of olive oil and season with salt and pepper to taste. Roast for 15 minutes or until they shrivel. Heat the rest of the olive oil in a pan at medium heat. Add the onion and stirring frequently, cook it for about 3 minutes or until soft. Peal the garlic cloves and crush them with a fork. Add to the pan the garlic, the tomatoes and its juices, the chicken stock and thyme. Let it simmer, uncovered for 5 minutes. In the meantime, make the Feta toasts. Spread the bread with the cheese and cut 4.3 cm (about 1.2 inches) slices. Toast in the oven for about 8 minutes or until golden. Sprinkle with the thyme and season with salt and pepper. Finally, blend the soup until creamy and smooth. Season with salt and black pepper. Serve warm with the Feta toasts.